Barnes produces engine components for virtually every major engine program. Components are located in the compressor, combustor and turbine sections of the engine. 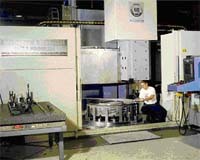 Complex machining including 5-axis CNC milling, CNC turning, CNC grinding, CBN grinding, and creep feed grinding, EDM of slots, holes and complex shapes. Barnes provides technical and management support functions including process planning, tool design, N/C programming, concurrent engineering, program management, materials management and MRP.